The article The differences between Pigiame paid ads and OLX paid ads – is a guest article by Njeri Karanja. If you have been looking to cut back your marketing budget and increase your sales, or to just start a business without having a physical location, then you need to pay attention to the online classifieds platforms and the offers and promotions under the platforms e.g. you need to learn about the differences between PigiaMe paid ads and OLX paid ads. The online classifieds marketplace has gained ground in Kenya in the past 5 years and with different platforms trying to improve their services, the innovation witnessed in the past 2 years has been phenomenal. 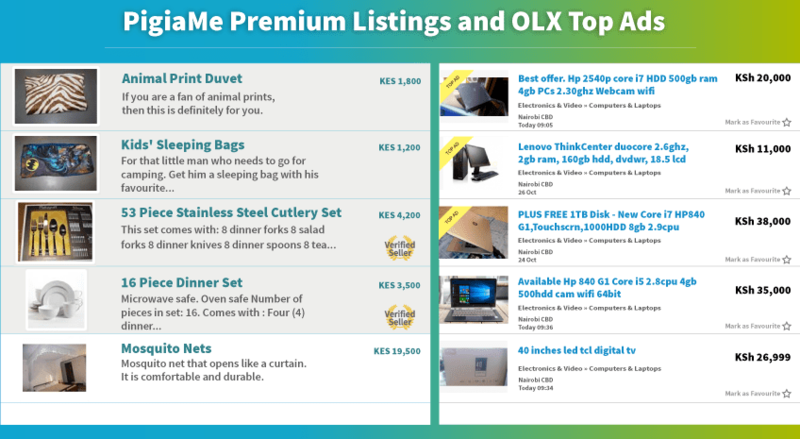 Companies such as PigiaMe and OLX have launched competitive products and services to give sellers more value – including the recently introduced PigiaMe paid ads and OLX paid ads. In this article we take a closer look at some of the offers both PigiaMe paid ads and OLX paid ads give their sellers and what they mean to you as a seller, if you are trying to get more visibility for your listings and improve your online presence. Paid ads have gained ground in Kenya in the past one year with different online classifieds companies allowing sellers to pay a small fee to place their advertisements on their sites and gain more visibility. Generally, placing an advertisement on these platforms is free and you can post as many advertisements as possible. However, your advertisement is pushed down as more adverts are posted. To ensure that your advertisement stays on the first page of the category, you can now pay a small fee, depending on the platform you use, for your advert to stay on the top spot for a given period of time. For example, it costs Kshs 400 to have your advert at the top on PigiaMe for 2 weeks. On the other hand, it will cost a seller around Kshs 5,300 to have your advert at the top for 1 week on OLX. Having a paid ad will ensure that your product receives maximum visibility, which translates into more leads and a good return on investment. The paid ads, also known as premium listings or top ads always appear at the top of the page for the specified period, ensuring that visitors to the site always see them when they log on to the page, which is the equivalent of putting up an advertisement, but in this case, the cost is much more friendly and targeted, giving you a maximum return for your investment. In the case of OLX, only 3 paid ads appear at the top of each resultant page load while on PigiaMe, all the premium listings are always shown above the free listings, and they pile on top of each other meaning that all paid listings are visible once a user loads a page. Paid listings are the future, and this has been proven by the success of sellers who placed paid listings on PigiaMe, the first platform to introduce this service in Kenya. According to the proprietor of Dabet Interiors, paid ads have enabled the business to increase its sales and make daily deliveries around Nairobi because the platform has a ready audience and the affordable paid ads service has boosted Dabet’s visibility and online presence. The competition gets tougher as you can also get to sponsor your category, which gives you more visibility. Category sponsoring ads appear at the top of every page in that category, creating more visibility for your products and this often results in more leads. The return on investment is very high for category sponsorship, depending on the category you are sponsoring. This is one of PigiaMe’s unique products that OLX is yet to introduce. If you are looking to market your products to a specialised segment of the market, this is a good offer as it ensures that every visitor to that category gets to view your advert and you stand a high chance of converting them. If you are looking to solidify your online presence but you cannot afford to set up your own website, you can do so with the premium business pages’ product. This is a unique product that allows you to create your own mini-website with your logo, map, and contacts. Premium business pages allow your customers to get all the information they need in one place and enables you to be more visible. The product has enabled many infant businesses to stay visible on the internet, the next frontier in business. This is a unique product by PigiaMe that allows users to immediately obtain a seller’s information. On the other hand, OLX has seller-listings pages where one user can place all their products. As a promise of quality and commitment to transparency, online classifieds platforms have dedicated teams of moderators who scrutinize every content that goes live on the sites. This step has helped to weed out con artists and boosted buyers’ confidence. This explains why online classifieds have continued to gain ground despite the initial problems they faced as a result of numerous fraud cases. Moderators have been introduced as an addition to caution messages meant to keep buyers safe when buying goods and services online. PigiaMe has a dedicated team of moderators which verifies the authenticity of sellers on its platform to ensure that only genuine sellers get to benefit from advertising on their platform. As an added advantage to their sellers, PigiaMe also has a ‘verified seller’ badge to give more prominence to sellers who apply for the service. However, OLX has an automated check system for screening sellers and does manual checks once in awhile to clean out fraudsters. This move to introduce in-house safety measures have enabled online classifieds companies to gain serious and genuine buyers, which has boosted sales for sellers using the platforms. If you are a small business owner and you are looking to increase your sales with a very small marketing budget, the paid ads introduced by online classifieds companies works well for you. In a bid to help sellers create more visibility and gain more clients, the platforms have also introduced services such as the verified seller badge and premium business pages. This has enabled sellers to reach more customers at a very affordable rate.